Despite its cunning use of alliteration and the exquisite silence in its ellipsis, this poem, in only four words, manages to decorate the reader’s mind with an intensely vivid wallpaper. To embellish this poem further with what Jack Kerouac called “poetic trickery” or fit several extensions, an attic conversion and a conservatory to its modest structure would only fog the image. Good haiku is like a good shot of Scotch and Helen Buckingham has several fine malts in her desk drawer. Despite using brief, fractured bursts of description, Helen’s longer poems glow with sumptuous imagery. Thanks to this poet’s expertise, Armadillo Basket proves that even the shortest and most modestly expressed lines of poetry can provide the reader with a feast of delicious images. Helen Buckingham’s senryu has appeared frequently in Prune Juice. 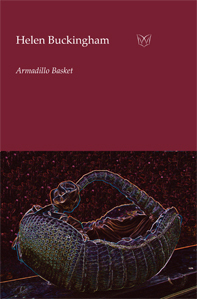 Her latest collection of long and short poetry, Armadillo Basket, is forthcoming from Waterloo Press.